Yes, as some would say, I have crossed over to the ‘Dark Side.’ I broke down and bought a mountain bike. My reasoning for this purchase was really for the off-season. With a potential heavy training schedule around the corner, I wanted to give myself some variety. Tri-City Cyclers have an Urban Assault ride that cruises the downtown trails and parks of Columbia, tours the university, city buildings, and generally heads all over the place. That’s a fun ride, and not really possible on a road bike. Ironically, I bought a mountain bike to ride in the downtown streets, and plan to use my road bike in the mountains. While my intentions are not to become a mountain biker, this could lead to some outdoor adventures down the road. When traveling to the Carolinas, I could explore the trails in Pisgah and Dupont forest. 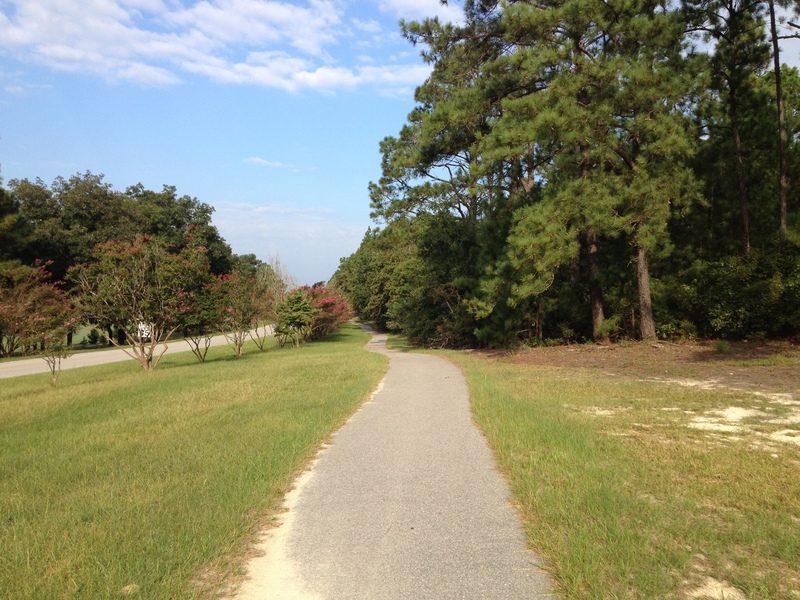 There are also nearby trails like FATs in Augusta, Harbison in Columbia, and the Palmetto Trail throughout the state. Someday I may even decide to take a stab at a more extreme mountain bike adventure. The Off Road Assault on Mount Mitchell could be fun. The same goes for the Leadville 100, Shenandoah 100, and who knows what else? The bike is a Trek Stache 7. I bought a close-out model from Brian, who just conquered the Haute Route Alps, at Outspokin’ Bicycles in Columbia. This is a hardtail 29er. At first I was tempted to go for a full suspension just in case I lean towards more serious adventures down the road, but opted for a mid-range bike. This will be plenty as my second bike, as I learn how to ride the trails. Why ride on the road when you can ride a path? 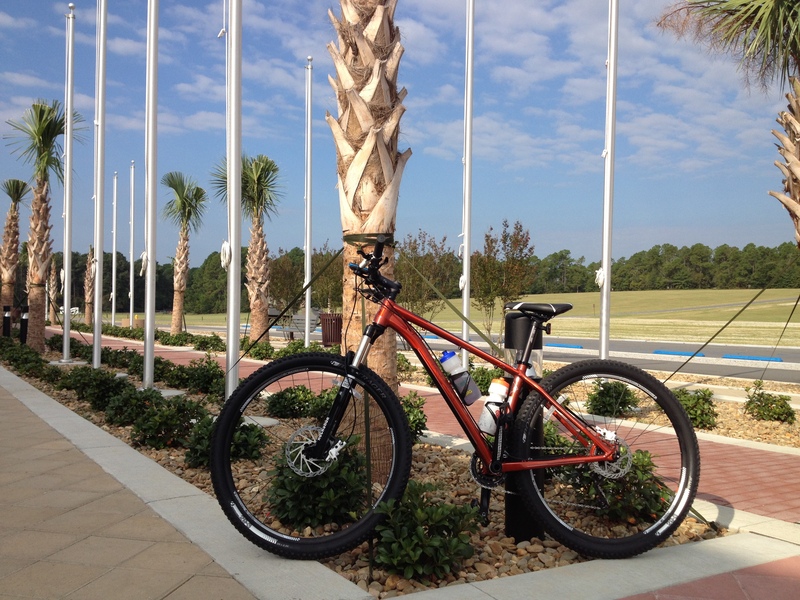 My first ride was around Fort Jackson, where I have sweated buckets on my road bike. The mountain bike gave me a new perspective of the fort. I was able to explore areas that I have curiously ridden past numerous times, such as Twin Lakes Park, beyond Ewell Road, and various side roads and trails. That’s what I like most about the bike. I’m no longer confined to the constraints of the local roads. If I want to go somewhere, I can just go there. One thing I noticed right away was the fitness difference, and riding on the fort was a good way to make a comparison since I’m so familiar with riding here with a road bike. From a cardio perspective, they are apples and oranges. With the road bike, once warmed up, my heart rate seldom gets below a tempo heart rate zone. With the mountain bike, the heart rate was almost always below tempo. It would elevate on more challenging terrain and, of course, uphill, which was a lot tougher. In this respect, it was like riding easy intervals. It is more like short sprinting, whereas the road bike is more of an endurance ride. Golden Arrow was freshly paved with a bike lane. Nice! The first ride was a blast, and I hope for many more soon. The downside was that the injury became a problem, which I’ll discuss in more detail later. Three day weekends are awesome, and even better when they are capped with a wonderful day of riding in the mountains. This Labor Day was the inaugural Tour d’Apple ride, coming at the tail end of the Apple Festival. 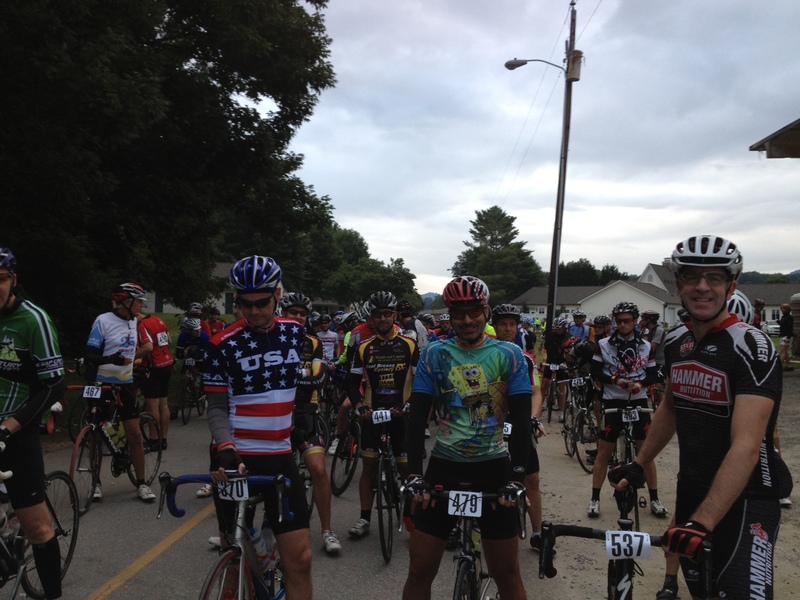 Several hundred riders converged to tackle a metric or full century around Hendersonville, NC. All new rides experience growing pains. Mistakes are going to be made. In my opinion, the difference between success and failure is learning from those mistakes, and making adjustments the following year. Just about everything was perfect –- plenty of volunteers, rest stops, and a gorgeous route. 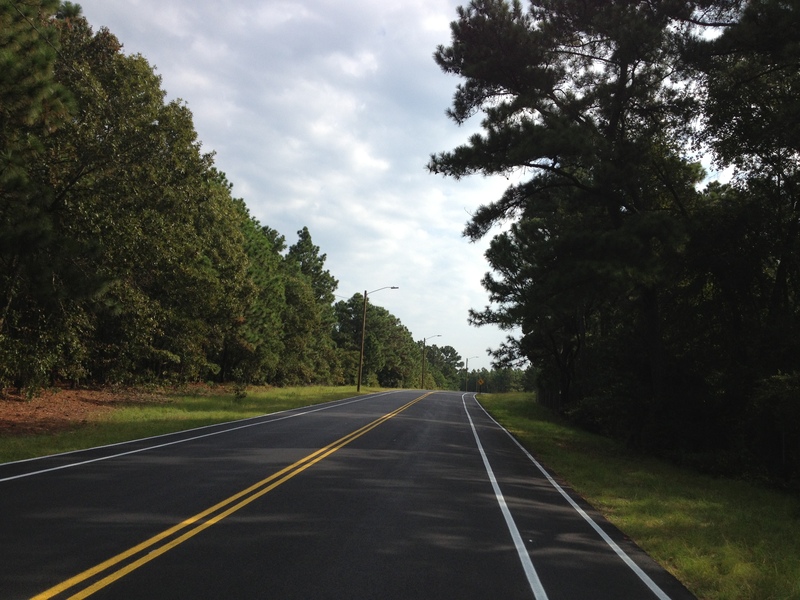 However, the main issues had to do with road markings and directions. There was a lot of confusion about where we should be going. I’ve already reached out to the organizers, and they are going to make this their focus for next year. Going forward, I expect this to be one of the top rides in the area. I began the day feeling good, but not wanting to push my injury too hard. I rode with Berry, a friend from home. His pace is not the same as mine, and he joked that he was my ‘anchor.’ He was protecting me from myself. We would ride together in between the climbs, and then climb at our own pace. I would usually wait for him at the top. The first major climb was up to Sugarloaf Mountain. It started out gradually, up Lamb Mountain Rd, and then steeply pitched back up after a short descent. The last several hundred feet were a double digit grade, a good test of the legs early in the morning. Mine responded. I could tell already that this was going to be one of my better climbing days. I waited for Berry at the top. It wasn’t his day, and he was already considering switching to the metric route. Since the routes didn’t converge until after Bearwallow Mountain, I convinced him to finish that climb before making a decision. Sometimes it takes a little longer to warm up. After some marking confusion, we found our way to Bearwallow Mountain. I may be in the minority, but I really liked this climb. It was quiet, with heavy foliage and a lot of scenery on the way up. The grade was mostly manageable, with a steep section midway through that gets up to 12-13%. Again, I was feeling good throughout this climb. The legs were fresh and flexible. I was still careful not to open it up, and climbed at a comfortable pace. We lost each other on the descent and I waited at the rest stop. And waited. And waited some more. I was starting to get worried. I sent him a text. No response. After waiting a bit longer, I had to go. There was a cutoff time, after all. I found out later that he simply took a wrong turn. His metric ended with 70 miles. As I rolled through Hendersonville, reality struck. Since I had spent a considerable amount of time off the road, I was well behind the pack. I encountered a group, but I was a little stronger than them. It wouldn’t work to ride together. It looked like I was going to ride the next 60 miles on my own. It turned out to be only the next 20. The route took us through Hendersonville. From there we traveled through familiar roads. We went down Mine Gap, and zoomed through Zirconia and Tuxedo, to the base of Pinnacle Mountain. Ugh. Pinnacle Mountain, my nemesis. It has been nearly a year and a half since I last encountered that beast, but I had not forgotten her. I was not looking forward to climbing her again. The cue sheet was not clear which part of Pinnacle we’d be riding. I was just hoping that it would not be the 25% grade. The climb up there was via Cabin Creek Rd. Just like Bearwallow, it was mostly mild save for a steep section. It totaled four miles, a little longer than I expected. My strength started to wane, possibly because I had been riding for 60 miles by myself, and possibly because the sun out and the temperature was rising. I found myself thirsty towards the end, and grunted through the last mile or so. 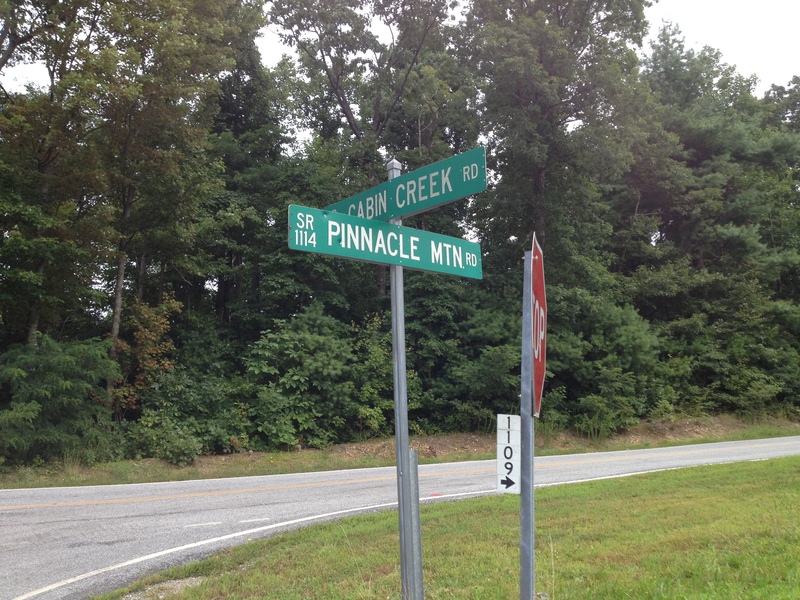 When I reached Pinnacle Mountain, I was thrilled to turn right. Guzzling a couple Gatorades at the rest stop got me refueled and refreshed, and I felt strong again for the remainder of the ride. The best news was that a small pack of riders caught me. It was there that I met Laurie from Charlotte, whom I soon found was riding at about the same pace. She had accidentally missed the Bearwallow turn earlier, and added six miles to her ride. We were both behind the big groups, and made for fitting riding partners. 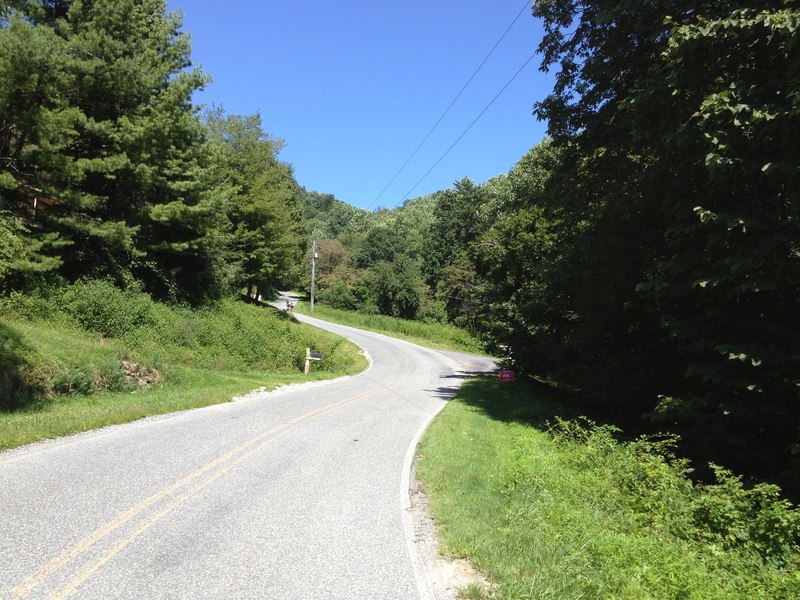 We descended Pinnacle Mountain through Sky Top Orchard, rode through Flat Rock and by the Carl Sandburg Home, before making way to the final climb – Jump Off Rock. This was the climb I was looking forward to the most, but we took an unusual way to get to it. Rather than going straight up Laurel Parkway, we took some side roads that went up and down. Again, the markings were precarious. I had to pull out my iPhone and say: “Siri, give me directions to Jump Off Rock.” I would hear the turn-by-turn instructions as I rode along, which gave me confidence we were heading in the right direction. When we reached the top, we were surprised it was so desolate. Where were all the riders? Were we that far behind everybody? Not at all. We found out later that most people had missed the turn to get there, and had inadvertently skipped it altogether. Laurie and I ended up with more than 100 miles, whereas most others had somewhere around 95. The descent back down to Hendersonville was a rush, not too steep, just right. Laurie was tired, having already ridden a century by that point. To her, the ride seemed never-ending. Still feeling strong, I took some extra pulls towards the end. Despite the hiccups, this was a terrific ride. We encountered apple orchards and scenic mountain vistas all day. I’m confident the organizers will iron out the details and make this a ride to remember. I will look forward to coming back. Riders smiling on the last pitch of Sugarloaf. A view of Bearwallow from below. Near the end of the Jump Off Rock climb. An empty Jump Off Rock. 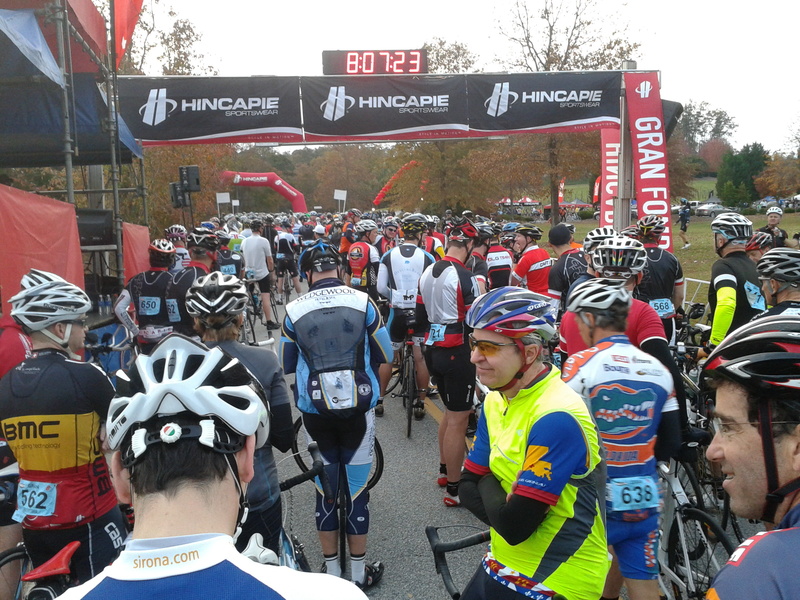 My main regret about last year is that I missed out on the inaugural Gran Fondo Hincapie. A great many friends and readers rode, and everyone I talked to had an amazing time. There were several VIP guests, over 1,000 riders, and they had pretty good weather. The course itself was as brutal as I expected, with some of the most challenging climbs in the southeast, and I understand that despite the suffering, it was a jovial, festive atmosphere. Just recently when looking at my busy fall schedule, I was on the fence on whether to participate at Hincapie this year. At first glance, it just seemed like too much. After seeing what they are doing this year, I’ve decided to take the plunge and ride. 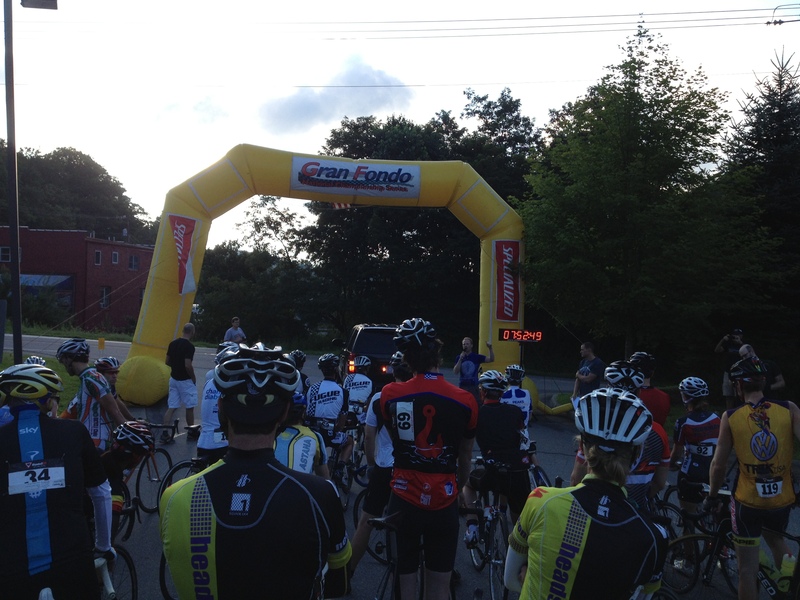 What really swayed was the latest news update about what they are adding to the 2013 ride. You can read about it here. To be honest, they could rest on their laurels, relying on George Hincapie’s celebrity to draw riders, and just phone it in. This shows me that they are genuinely doing everything they can to make this a memorable experience. There are a couple changes I really like. The expanded packet pickup is going to be a major help. If I remember correctly, last year they required that packets get picked up Friday night in Greenville. Getting there on a Friday would be logistically challenging when people are coming in from out of town. Additionally, they are moving the start time to 9am, which will make it easier for same-day travelers. Not to mention, that’ll help with the temperature on this late October day. Many of these changes are logistical, and they probably learned from their first experience last year. They will have full SAG support, and I am betting it will be superior to other rides, closer parking, shuttle service, and more. It sounds like smart event planning to me. They are also adding fun stuff like a 5k, Beer School (! ), and by marking off the switchbacks on the Green River Cove Climb. Having ridden Green River a number of times and counted the switchbacks, I’m curious what sort of fanfare they’ll add to spruce up the climb. I’ve heard a couple complaints about the price. True, it is more expensive than other rides. My first reaction last year was the same as many others. That’s a lot to spend to ride a bike all day. This year my perspective on event prices has changed simply because I’ve met a number of ride organizers, and learned what goes into these events. Many will lose money the first year. These things aren’t cheap, especially when you have state of the art timing systems. Hincapie is a premium ride, and given the high percentage of people who have registered for the VIP package, it seems that price is not that big of a deal. I’m going to ride, and I’m already getting excited. The colors should be beautiful. I may get to meet a few of my cycling heroes. And this will be a fitting finale to a great season. See you in a couple months, George. Scott, Spongebob and Captain America at the front. After making the decision to cancel my travel plans for Blue Ridge Breakaway, I was disappointed and bummed. This event was at the top of my priority list for the year, and with the nasty weather continuing to roll in through the weekend, it looked like a wash out weekend. I had been emailing Cecil, the Ride Director, about the forecast. As I posted on Friday evening, there were some major systems coming through, and one of them was threatening the event. He noted that a lot of the heavy stuff was pushing into South Carolina, and despite the forecast, they had a surprisingly nice day on Friday. He was optimistic; I was a little pessimistic looking at the same info. After getting to bed early, I awoke at 2am with some coughing spasms. I looked at the clock and groaned, but since I was awake, figured I would check the radar and see if I would be kicking myself. What Cecil had observed yesterday was happening again today. The bad stuff was flowing into SC, while the Smokies were going to be unscathed for a lot longer. The chance of rain at the start had reduced to 0%, with gradually increasing chances as the day progressed. I did some quick math, then bolted out of bed. It was a 3.5 hour drive. I could actually do this thing. Within 15 minutes, I had my bike bag ready, praying that I didn’t forget anything important. Soon enough I was on the road heading to Lake Junaluska. The drive down there was through an ugly monsoon until I reached the NC state line, where it then calmed down. I arrived at the Visitor Center at exactly 6am. Cecil was behind the registration desk when I walked up. He looked at me curiously, recognizing me, but not believing his eyes. “Cecil, Aaron, I said.” We erupted in laughter and man-hugged. The look on his face was priceless. I was there, but I was totally unprepared. I had eaten chicken and salad the night before, not the type of fuel for 105 miles of mountain riding. Fortunately with this ride, I pretty much just needed my bike, some gear, and a little sense. The ride is so well organized that there’s not much else to worry about. The only major concern was the afternoon weather, but I was relieved to hear about their comprehensive tracking center and communications. That would come into play later. We saddled up and several hundred riders left the the Lake Junaluska Welcome Center. It was easy early riding, as we were escorted via police with silver medalist Lauren Tamayo leading us out. We had to deal with just a small amount of rain within the first 20 miles or so. None of it was very bad, and I think a lot of it was coming up from the road. As we rolled around the mini-climbs, we started to see signs of the sun. Things were looking good. The sun peered through the clouds as we rode on rainy roads. Unlike a lot of mountain centuries, the pack breaks up pretty early. Most of the separation starts at Coleman Mountain, continues through Rush Fork, and then splinters at Hyder Mountain. It is easy to forget about the earlier bumps compared to the later climbs, but they were substantial. Many of these had steeper grades and, to me at least, took more of a toll on the legs. During these early climbs, we were riding with people on the shorter rides (“Trout”, “Panther”, “Rabbit”). The 105-mile century was called the “Hawk,” and we finally set out on our own course as we rode further south through Clyde. On the south Highway 215 climb to the Parkway, I caught up with John from the Raleigh area. On a climb this long, it’s good to have a companion for some conversation. We chatted it up as we rolled through the mild grades. This climb is not the most challenging in the world, but it goes on forever, and gains over 2,000 elevation. I remember that last time the road had been chewed up, and had been repaved since. It didn’t seem that smooth, but it was certainly an improvement. 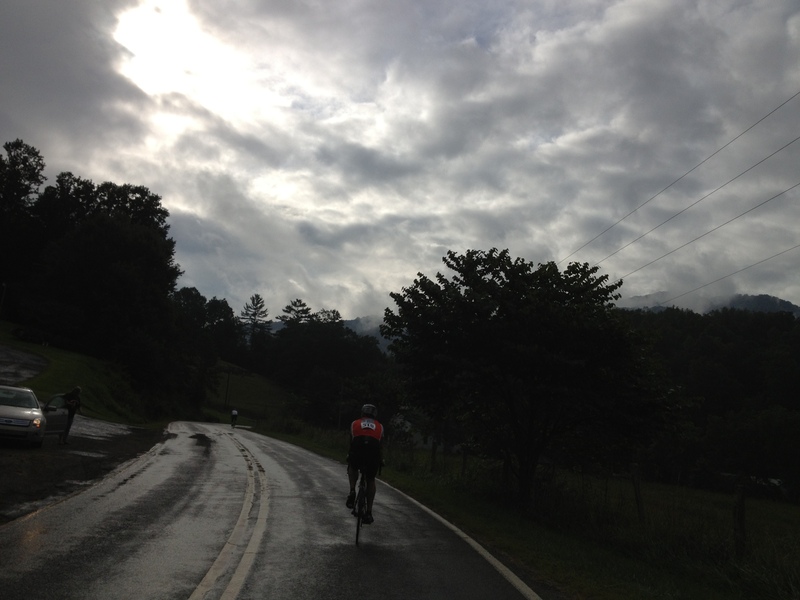 As we got near the top of the climb, we approached a heavy cloud cover. We climbed through the mist, into the clouds, and they remained with us most of the day. We had some remarkable views from the parkway, where we could see into the horizon under the clouds on the left side, while the right side was just vast, puffy whiteness. 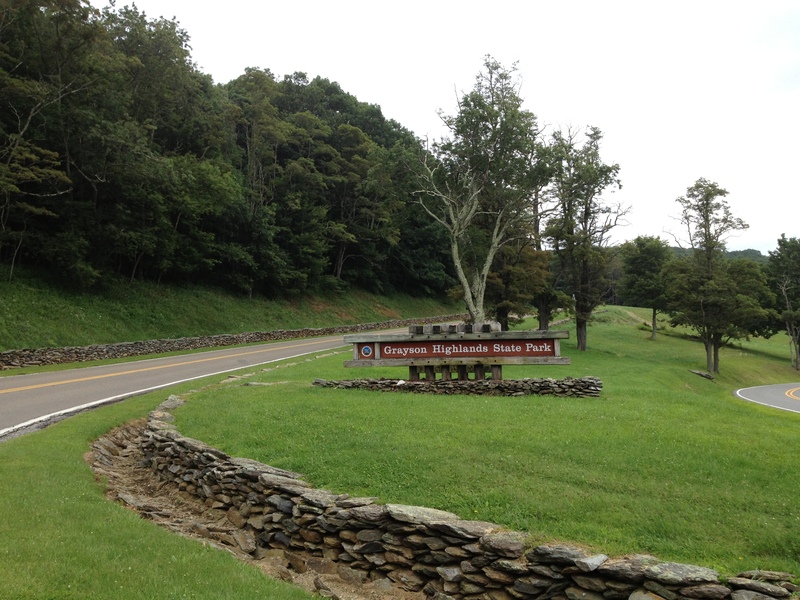 The next climb would be up to Richland Balsam, the highest point on the Blue Ridge Parkway. Most of it is up and down, a few hundred feet at a time. The final climb was just about 500 feet at a mild parkway grade. Even though it counts as a climb, it felt like easy riding. John and I stopped for a photo op at the high point. The big descent followed. I’ve already talked about how much I love this descent, although I’ll admit, it loses a lot of its luster coming down through the clouds. After a lot of gliding, some pedaling for the little bumps, and before we knew it, we were through the dark tunnel and down to Balsam Gap. The last climb of the day would be Waterrock Knob. Been there, done that, and wasn’t looking forward to it today. Again, it is a mild grade, but it goes on for awhile, about seven miles at a continuous incline. Having John around to chat helped matters, and then about midway through the climb we bumped into Kelly, a website reader who I had yet to meet in person. It was good company for this climb, and that took the bite out of it. 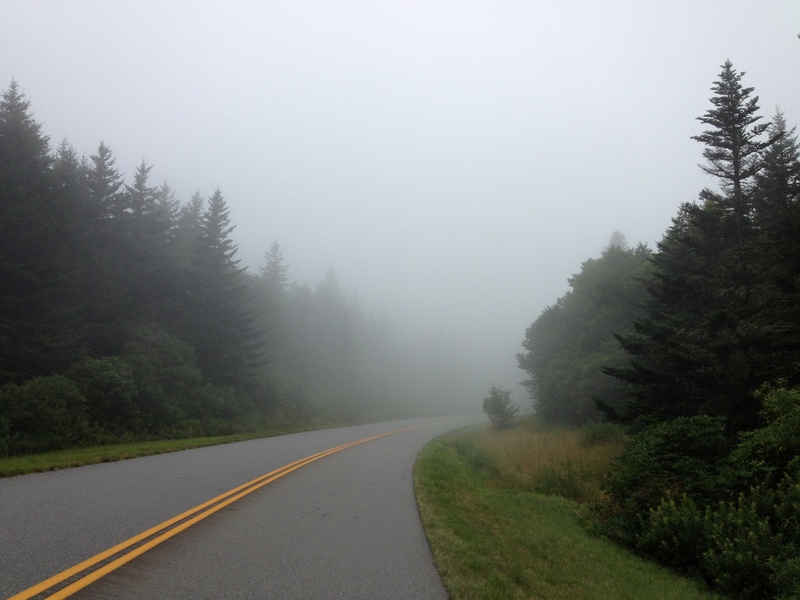 We climbed through a lot of clouds on the parkway. He might as well have shot a gun in the air or yelled “start your engines,” as I was immediately back on the bike, descending to Soco Gap. Here it became real damp and misty, and the moisture was more apparent in the air. I’m not sure how close we were to the weather, but we escaped without issue. 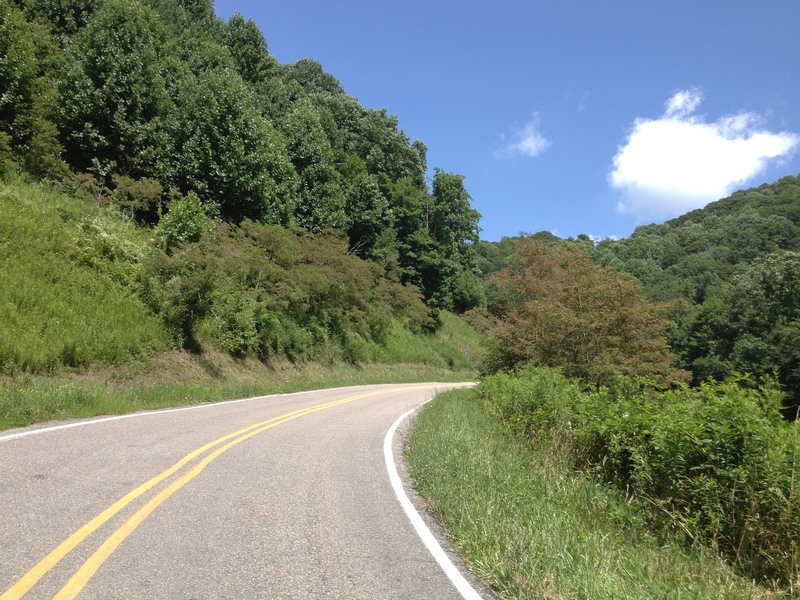 Finally I reached Soco Gap and made the turn towards Maggie Valley. It would be mostly downhill from here. The drop here is steep and you have to deal with some traffic. I remember from the last Breakaway that the road is bumpy and chewed up. That wasn’t the case this year. It was quite smooth and a nice descent. Traffic also wasn’t an issue. They had a huge sign at the side of the road that said “Bike Race in progress. Bicycles sharing highway next 6 miles.” Thanks guys. All the motorists were respectable and kept a comfortable distance behind us. John and some other guys caught up through the 5-mile sprint from Maggie Valley back to the start line. This section is mostly flat or slightly downhill at 1-2% grade, which was nice, easy riding to finish the route. Cecil was right. The weather held off, and we were able to have a tremendous ride. I found out later that there were some close calls with storm pockets. They had weather alerts at all the rest stops, just like what I encountered at the last one. The showers got closer as the last riders rolled in, but fortunately the major weather missed us completely. There were no accidents, good riding weather, and the event was yet again a huge success. On the road from Junaluska, 105 miles ahead for some. Great signage and intersection control. Lake Logan always looks scenic regardless of the clouds. Climbing 215 via Lake Logan Rd. We could see the clouds that we would be climbing into. Towards the end of the Waterrock climb. Our final fivesome rides in together. You read that subject correctly. I have shamelessly taken the wheel on the influence of performance enhancing substances. After a few months of annoying setbacks, I decided to turn to chemicals in order to get back to speed. Rather than continue under a cloud of suspicion, I have decided to take the path of honesty, and come clean now. I will not waste your time with regretless confessions later on Oprah’s couch. Flashback to a couple days ago: the cold that never ends continued it’s cursed streak of not ending. This weekend is the event I’ve been looking forward to more than anything else in the fall, and I didn’t want some sniffles and a sore throat to get in the way. On the other hand, I didn’t want to punish my body and delve further into the sick, making the cold that never ends continue even longer. I was fortunate to get a doctor appointment yesterday morning. “I’m still sick, Doc!” I said as he looked puzzled to see me again. And then I coughed. I’ve been doing a lot of that. He did all those doctor things, and determined that the infection was gone. Even though I still felt like a mess, my condition had actually improved. That was a relief. Could I ride this weekend? Yes, he said, but I might hate it. This was a pretty rough cold, and I could be dealing with the coughing aftermath for quite awhile. I appreciate every last bit of lung capacity when climbing a mountain, and there’s lots of training to be done to eventually complete the Parkway. Could we do anything to speed it up? Yes, we could. The answer was drugs. He prescribed me a steroid, prednisone, which would alleviate inflammation in my airwaves. It would help with that nasty cough, and allow me to train at somewhere close to normal capacity. My ears perked up. Steroids? Were these of the performance enhancing variety? Would I notice a difference? Not really, he said. In fact, if taken long enough, these would have the opposite effect. I would get fat and never want to leave the couch. Fortunately I had a cycling community to give me the real scoop. Some others had taken the same thing, and they felt that it did make a difference on the bike. They also warned me of insane appetites, water retention, bloating, and some increased energy. The good news is that after my first dosage, the cold symptoms were greatly minimized. I actually felt up to saddling up. My energy level was definitely up. I felt euphoric, which was probably a combination of the drug and finally getting out of the house. It was back to Tri-Cities for the Tuesday group ride. As we rolled out on the 12th street extension, some of the phlegm came back. I let out a few coughs, careful not to be ‘that guy’ and overflow into the paceline. So far so good, but as I told a friend, the true test would come on the first hill. I would either tear away from the pack, or completely blow up. Feeling good after making the turn onto Old Wire Rd, I eagerly awaited the hills. The first one was not so bad. I hung on with the pack and felt fine. On the next climb, I somehow ended up in front and kept going. I looked at my heart rate, and noticed it was about 10 beats faster than usual. The speed was faster too. What in the world? It wasn’t killing me like it normally would, so I went with it. Might as well see what these drugs can do. I kept on maintaining the same heart rate. I looked back, and to my surprise, the pack was behind me. For real? It was then that I realized that along with my speed, lactic acid was also accumulating faster. My pace slowed, and I could feel my legs burning. Ugh. The remainder of the pack caught me, and I fell off to the side, easing up before regaining my composure. I stayed within the pack for the rest of the way, playing it smart and not trying to show off. It was when we hit the final fast 10-miles when another symptom kicked in. All of a sudden I felt like I had a rock in my stomach, and ballooned up to 300 lbs. I was able to hang on during the entirety of the speeding downhill. It was at the next big hill that I ran out of steam. I could feel my stomach muscles punching each other. I dropped like a bad habit. Lesson learned. Drugs are bad, m’kay. This prescription will last me until next week, after which I’ll hopefully be cold free and back on the path towards my parkway goal. I may not be totally comfortable, but I’ll be able to ride this weekend. Now that’s some news I can handle. Edit: Apparently a couple people took this post a little seriously and accused me of being a doper. This was meant to be tongue in cheek. Prednisone is not a banned substance according to WADA. Before I delve into the lengthy ride report, I’d like to talk a little about the timed format of this GFNCS. As I noted in the Preview post, the overall course is not timed. They only time four sections of varying distances, mostly climbs. In short, I loved this format! And I didn’t realize why until I was on the road, experiencing the difference between this structure and the typical ‘cookie’ rides. 1. Eliminates the knucklehead factor. Of course there are always going to be some knuckleheads (like the guy that forgot his helmet. Doh! ), but this eliminates most of them. The big difference is you don’t get people who shoot out of the gates and make poor decisions in the interest of getting a better time. 2. Sociality. All rides are social, but this format allowed for more socializing than I would expect. Between the timed sections, people would ride easy and converse. To my surprise, I found myself chatting it up with a lot of people I’d never met before. The heavy breathing hammerfest would not start until we passed through the orange cones. 3. Control. This goes with #1. The organizers can place these timed sections at designated areas with low risk. This is the same notion as sprint zones in a group ride. You find an area with low traffic that allows riders to flex their muscles. For the Boone ride, these four sections were on hills. They were good spots with hardly any traffic, the perfect place to allow riders to try to prove themselves. 4. Fueling. The aid stations were situated between timed sections, so there was not a need for riders to weigh themselves down with fuel. Nobody had to carry 5 bottles in order to eliminate stops. Some of the guys only carried one bottle. They would just fuel up at the stops. Since everyone stopped and ate, it also reduced the chances of people bonking on the road. Because of all this and more, 104 miles of riding and climbing was actually a blast. Thanks to the organizers and volunteers for making it such a treat. Even though the ride was hard, I’ll definitely be trying others in the series. As for the ride, I’ll say just one word: Ouch! This was the real deal, a true challenging mountain century that throws everything it can at you. After Reuben made the pre-ride announcements, we set out from downtown Boone. The start was mildly cool with a bit of wind. The roads were damp as an early morning storm had just passed through. Reuben giving pre-ride announcements as we prepare to head out. We could not get too comfortable, as the first timed section started right away — Russ Cornett Rd. This would not be the most challenging climb of the day, not even close, but it served as a wake-up call since it came so early. We dealt with some easy grades, occasional descents, and some false flats. The young bucks stretched their legs and attacked the climb, as they should. I rode my own pace, not wanting to blow up too early or hurt myself later. Russ Cornett placed us at the middle of the Schull’s Mill Rd climb. This is one of my favorite climbs in the area, but I was grateful not to have to ride the whole thing. We skipped the Parkway and turned right onto Hwy 221. The only times I have ridden 221 were on Bridge to Bridge when weather pulled us off the Parkway. This was the first time I could really see around me from 221. It was gorgeous. There were so many splendid views as we rolled through, up and down, gradually making our way up in elevation. The best part was when we could see the Linn Cove Viaduct straight up in the sky above. Seeing it from below made me appreciate the engineering brilliance even more. Highway 221 was the second timed section. This time I was a little more warmed up and felt better, but reminded myself that I wasn’t racing. I started at a normal pace. A few people stood up to push harder, passing me instantly. I didn’t take the bait, but stills ended up catching a lot of those people. 221 is gradual enough that it fits my current style of riding, and of all the timed sections, this was probably my best. We had to deal with some wind as we rolled through Linville and Banner Elk towards Newland. Since I’m recovering from a chest cold that I cannot seem to shed (which turned out to be a lower respiratory infection), and of course, a few injuries, I was tempted to take the shorter route. That temptation didn’t last long, as I found myself turning left on the wheel of Dave, the eventual winner of the Masters 55+ category. This is Dave, winner of the Masters 55+. At the next aid station, I met up with Stuart and Karen from Raleigh. We had chatted some on Schull’s Mill and 221, and seemed like a good fit for a riding trio. Stuart was a beast, very strong rider. He would attack the climbs and then wait at the top. 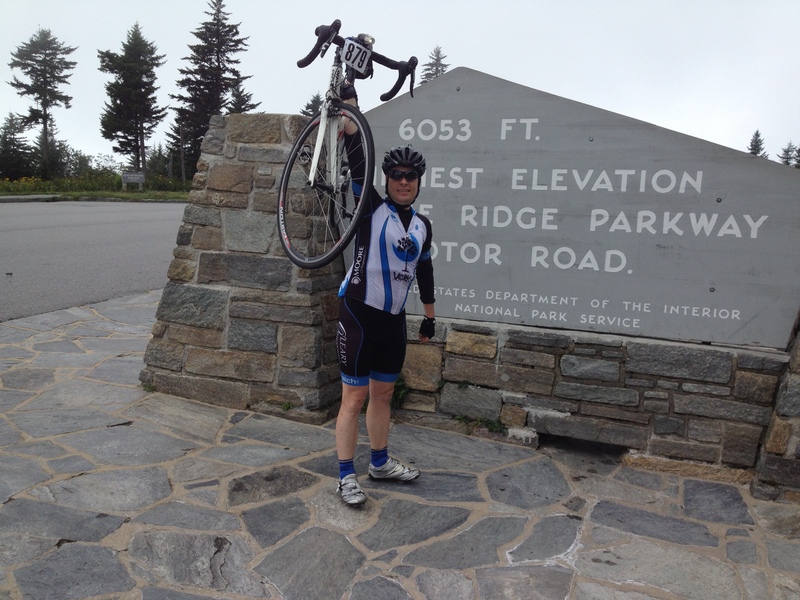 Karen was also strong and would out-climb me, but was a slower descender. Another aspect I like about this format is that it allows two people with different paces to ride together. They were great riding companions, and courteously waited at the top of all the big climbs. Refer to item #2 above. We had a great time between the timed sections, as we suffered through a difficult course with a lot of laughs. 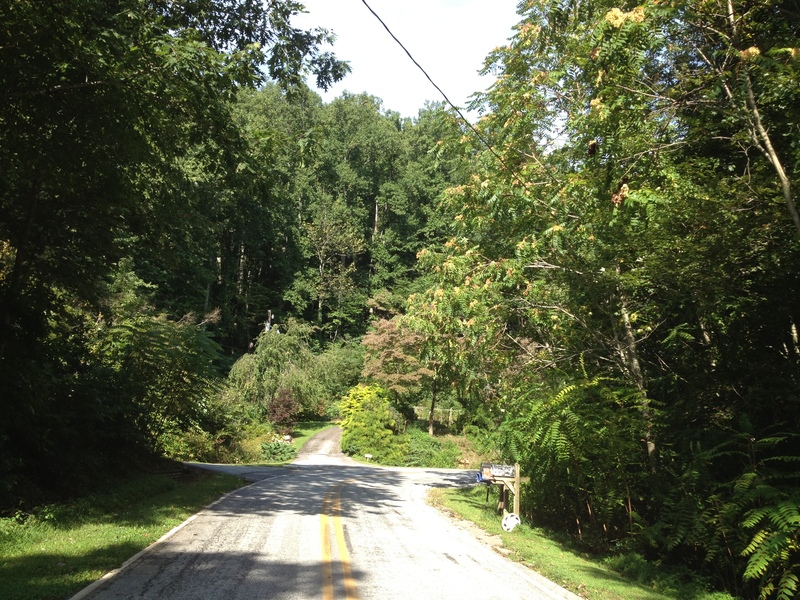 The next timed section was Beech Mountain Rd. 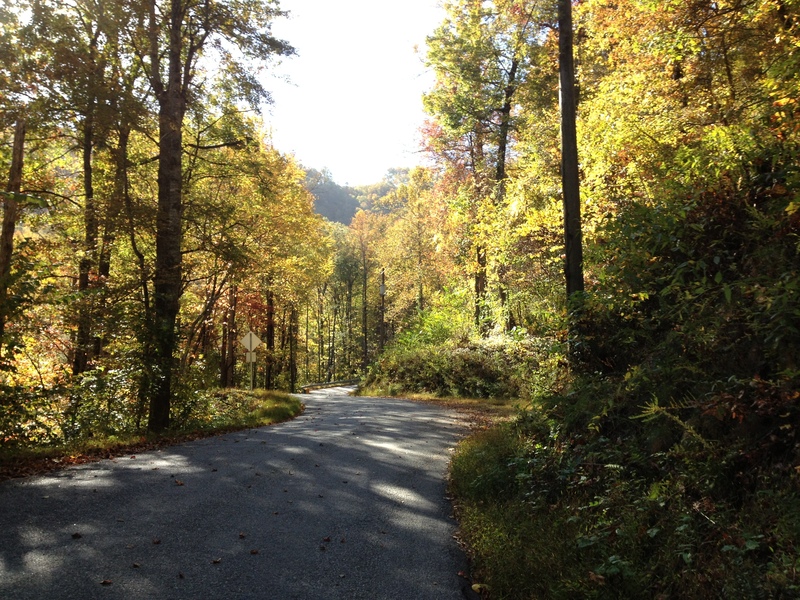 This is not the same climb as the historic Beech Mtn Pkwy, but instead heads up the backside of the mountain. This climb was my favorite of the day. The grade was rarely punishing, and the scenery exquisite. The most alarming part was a large black snake who had positioned himself in the riding lane on the right side of the road. I was in a zone and almost ran right over him. Stuart almost did the same. The snake was not moving and could have been dead, but I suspect he was only sleeping in the sun. Beech Mountain was the most rewarding because of the terrific downhill. The upper portion was perfect because it wound around without a very steep grade, the type of descending that makes all the climbing worthwhile. The lower portion was steeper and less curvy, so we bombed down and hit our top speed of 45 mph. It was a rush! Stuart kicked it into high gear when the Beaver Dam Rd timed section began. I remained behind with Karen. This was a longer stretch, and the early false flat lulled us into a false sense of security. Karen and I rode together easily when the road turned up. She went on ahead while I fought my own battle. It was a little steeper, but I could deal with the 6-8% grades. If only they would have lasted. As we approached the end of the climb, the road turned up — way up! It was in the 11-12% vicinity. No problem. I can muscle through this, right? I turned the corner, and there was yet another ramp, equally steep. They kept coming and coming for a good two miles. By the time I reached the top, I was a beaten man. Stuart and Karen were sitting down, and I collapsed beside them. Ugh! After a couple minutes to rest my back, we were back on the road. This time we had a gravelly descent, which would be followed by about 10 miles of easier riding. One of the steep inclines near the end of Beaver Dam Rd. I loaded up on food and drink at the last rest station, just to stave off any potential bonks. The big timed climbs were out of the way. We knew Mast Gap was ahead of us, but that’s more of a hill than a climb. We had this made! Holy Mother of God! We did not know what waited for us! 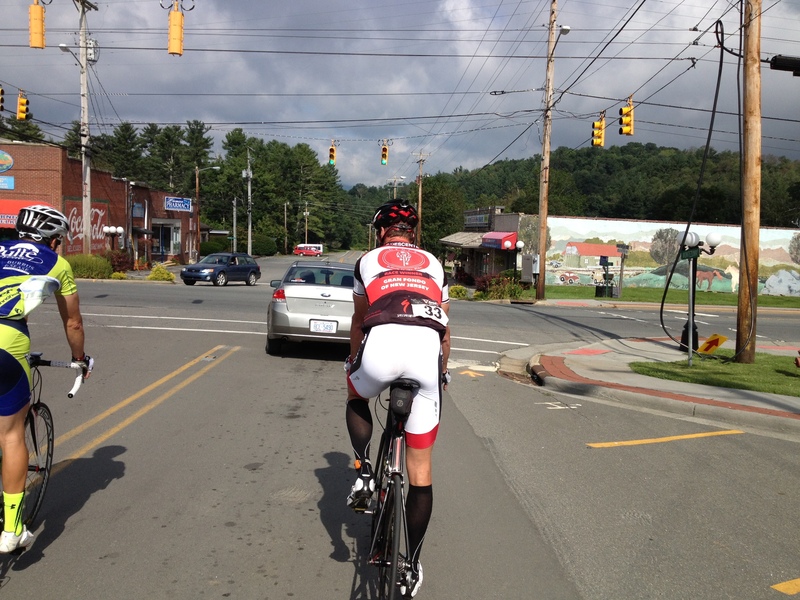 After we rolled through Valle Crucis and the starting point for BSG, we turned left. ‘Where does this go?’ I wondered. The answer was up, straight up. Bam! The road was immediately at 13%. Fine, I can handle another steep hill or two. I inched my way up the first hill, turned a corner, and Bam!, there was more waiting for me. This continued around a few more curves. At one point the grade dropped down to a more manageable 8%, but as soon as I got comfortable, it was above double digits again. I watched the miles tick by, knowing that we were close to Boone, just waiting for the final downhill to the finish line. One of the brutal quad killers at the end of the event. A nice lady was watering her lawn and shouted, ‘You’re almost to the top.’ Apparently she had been telling a lot of struggling riders the same thing. After .2 of a mile, the top finally arrived, and a relaxing descent followed. We turned right onto White Oak Road. Bam! The road turned up again, and kept going, and going, and going. This one was not as steep, but the 8% grades felt like 20% with all the mileage already on our legs. When it did turn up to double digits, it was sheer pain. I thought of stopping a number of times, but held onto the bike, inching upward. I kept grunting and grunting until I reached the top, until finally after a couple miles, I was there. I’ll just say that whoever created the Strava section for those two climbs had it right. That was a brutal finish! But it wasn’t quite over for me. I had finished the climbing, and had a mile until completing the event. I heard a pop and a hiss, and knew instantly what happened. My rear tire flatted, and and it was a bad one. One mile from the finish line, and I couldn’t even coast in. I got a ride for that last mile, but I’m counting this. 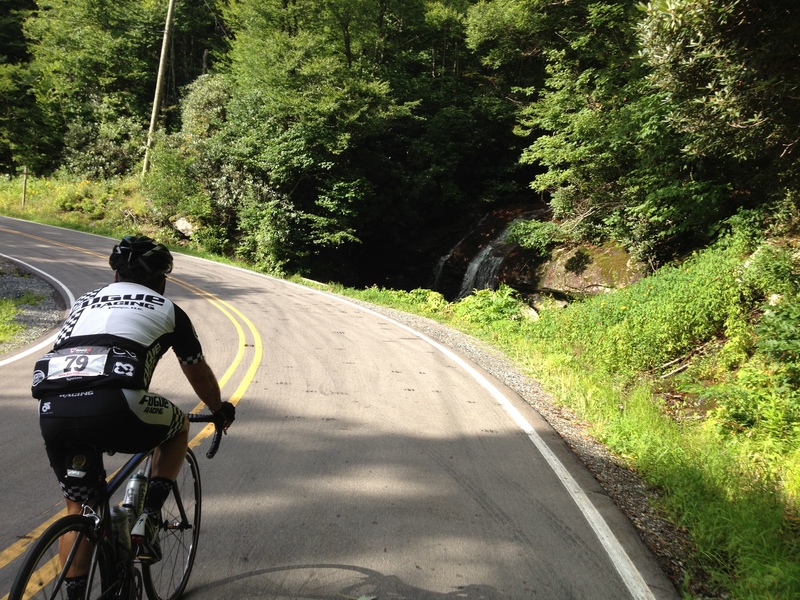 103 miles with over 10,000 feet of climbing is a ride for the ages. Congrats to the organizers for putting on a terrific inaugural event. I expect this one will be popular in the years to come. Russ Cornett Rd. These cones designated the timed sections. On the Russ Cornett climb. This is Ron from Wilmington on Highway 221. The early part of the Beech Mountain climb. Climbing to the sky on Beech Mountain. Aid station 3 had a nice view, even though we had to climb that big hill. Stuart pulled us like a champ. Thanks! Since I would be up in the High Country a day early, I decided to make my warm-up ride a little more interesting. Usually I will spin for 10-20 miles before a big ride, just to get the legs fresh. 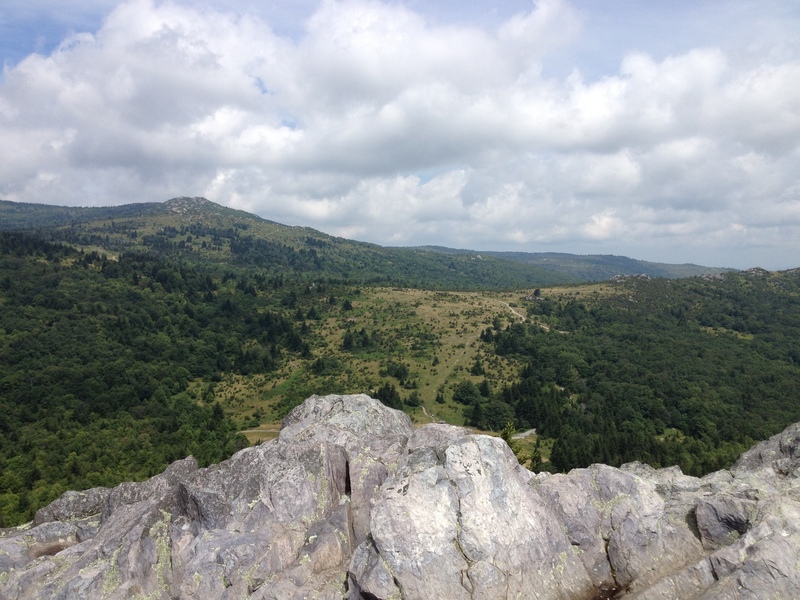 This time I decided to do so at a state high point, Grayson Highlands, Virginia, which is about an hour north of Boone. Since this is a warm-up ride for a mountain century, I didn’t want to overcook. The plan was simply to park at the visitor’s center, drop down to the entrance, turn around and climb back up. This isn’t my ideal way of climbing, sort of feels like cheating, but that was the plan. As I drove up, I noticed that Highlands Parkway climbs to the base of Grayson, and the last couple miles are relatively steep. I decided to extend the ride a little bit, descend until the road becomes flat, and then turn around to climb. The descent ruled. Just when you’re barely outside of the Visitor Center parking lot, there’s a view of 5,700 foot Mt Rogers. It didn’t come through on the pictures, but could be seen from the naked eye. I stopped for the photo op before dropping down the rest of the way. The grade varies, but there are some nice, straight sections inside the park with 8-11% grades. I sailed down those until I reached the lighter grades at the bottom, where I had to keep pedaling downhill. I turned left on Highlands outside of the park and continued the descent. This stretch had some tighter, steeper curves, which required a little bit of brakes, but it was still a blast of a descent. After a couple miles, the road straightened out and I expected flat. Nope. It was still dropping, although not nearly as steep. It was around the 2-4% range. I kept descending. The road continued to gradually lose elevation. I was starting to get worried. By the time I turned around, this was going to be a long climb. Soon I was over 10 miles, and had descended over 2,000 feet. As I passed 11 miles, the road began to turn up a little bit. Before I knew it, a dog darted straight at me. This was a big, white dog, and boy was he fast! He covered the few hundred feet from his house to my bike quick. The road had turned up enough to slow me down, so I whipped the bike around, and sprinted in the other direction. Instantly I was at 25 mph. I turned around, expecting him to be gone, but the guy was still chasing and barking! I yelled “NO!” and beckoned it away. He was within 10 feet of my rear wheel, charging hard before he finally gave. As I drove by later, I looked for the dog and instead saw a huge “Beware of Dog!” sign. Noted. Now came the climb, and it wasn’t too bad. The grade for those first few miles was easy, in the 2-4% range. This turned out to be great as I needed something to warm up my climbing legs. 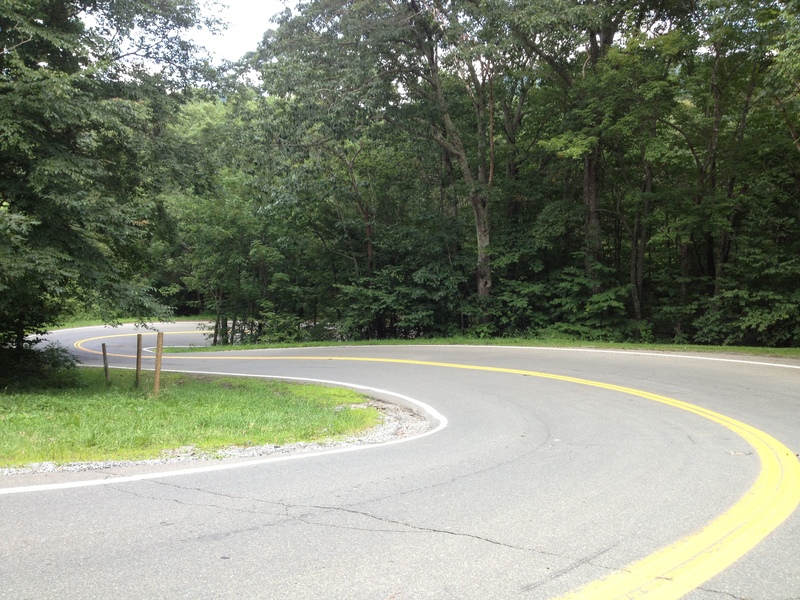 The real climbing began near the end of Highlands Parkway when the curves began. That started with a stiffer grade, and for a short stretch it was in the double digits before relaxing to 8%. I was careful to watch my pace and keep things comfortable, and chewed the miles away. This is one of the tight Highlands Pkwy sections. By the time I turned back into Grayson, the sun was out and the view was beautiful. This is a nice climb. The scenery reminded me of Brasstown Bald, only without the punishment. The early part of the climb was not too difficult. Around the middle, after the ranger station, it gets a little tougher. That long 8-11% section that felt so great going downhill didn’t feel as great now. Again, I took it nice and easy, and felt alright. There is not a natural summit. The climb ends at the visitor center, and from there you can hike about a mile to two viewing points – Little Pinnacle and Big Pinnacle. I changed out of my cycling gear, and took to the woods. It was worth it. 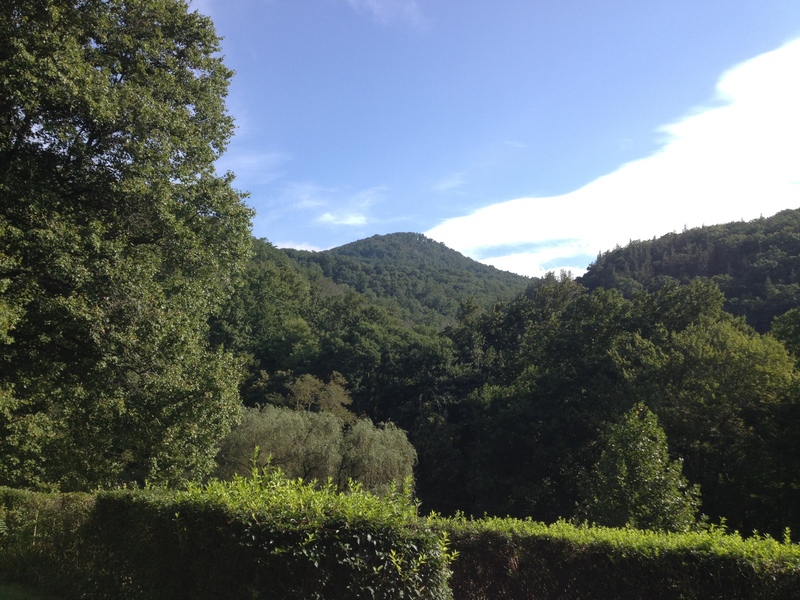 The overlooks were gorgeous, and afforded views of nearby Mt. Rogers, Whitetop Mountain, and others in the area. The view from Big Pinnacle. That’s either Rogers or Whitetop. It turned out to be a good ride. And another state highpoint can now be checked off the list. I’m ready for the big ride tomorrow. This was the only viewing opportunity. Without a summit, I had to make do with the lookout. Rogers is out there in the distance, although probably not visible in the image. This was the summit. Not too exciting. The view from Little Pinnacle.